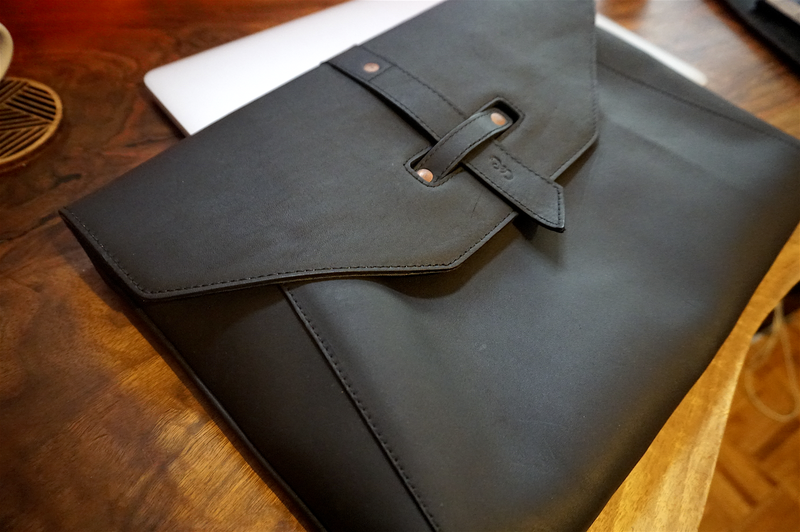 With Apple announcing new MacBook Pros last week, Pad & Quill’s latest bag for MacBooks arriving at my office was perfect timing. 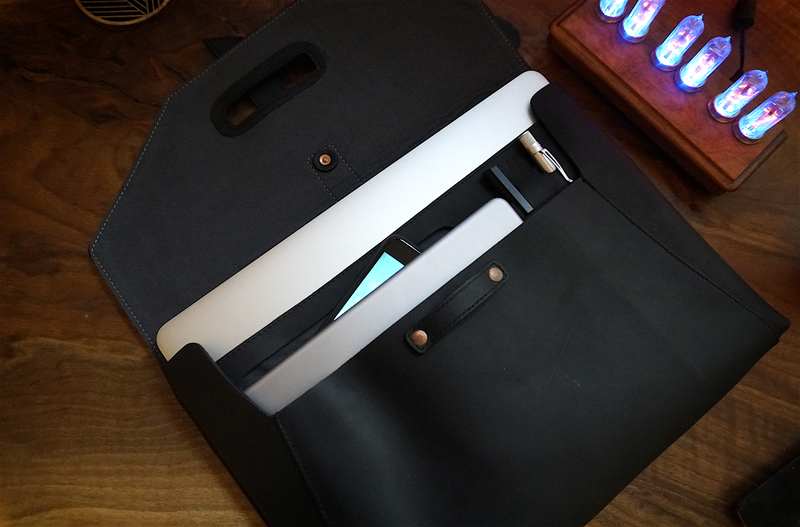 The company makes three sizes of the Valet Luxury Laptop Bag, one that fits 11- to 13-inch MacBook Air & Pro models, one for 15-inch models, and one that offers a custom fit for Apple’s smallest notebook, the 12-inch MacBook. The bags will fit Apple’s newest MacBook Pro models as well as older models of the same size. I reviewed the 15-inch version. The front closes with a strap made of the same full-grain leather as the rest of the bag that runs under another to keep the top flap closed and secure, both of which are attached to the bag with hand-pounded copper rivets. The idea is that it makes for quick access without any zippers or buttons, and it does. Even with no zipper or button, the strap holds secure enough that the weight of my 4.5-pound MacBook Pro (original 2012 Retina model) didn’t push it open if I held it upside down. Personally I appreciated the quick access when traveling recently and having to remove my MacBook for airport security checks. 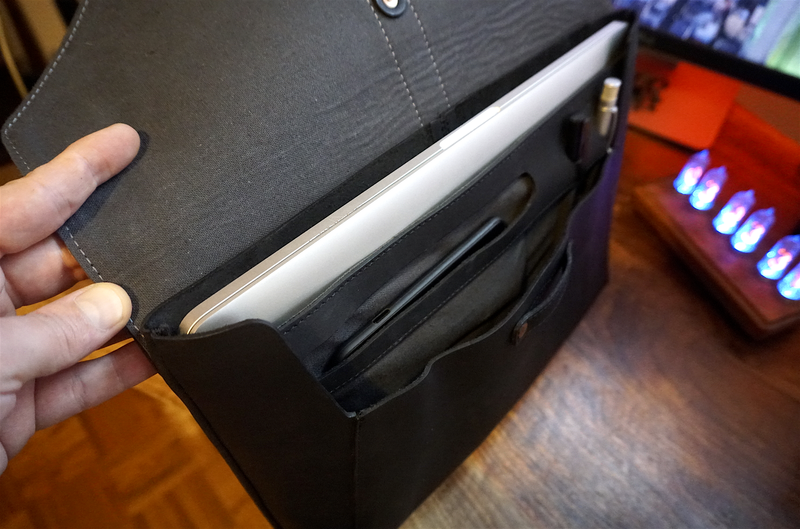 The 15-inch Valet Luxury Bag I was sent fits the old Retina MacBook Pro very snuggly, so the new MacBook Pro 15-inch, which shaves off half an inch from the width of the old design, should sit quite comfortably in the bag’s main opening. It will alternatively accommodate an iPad up to the largest 12.9-inch iPad (the 12-inch version up to 9.7-inch). 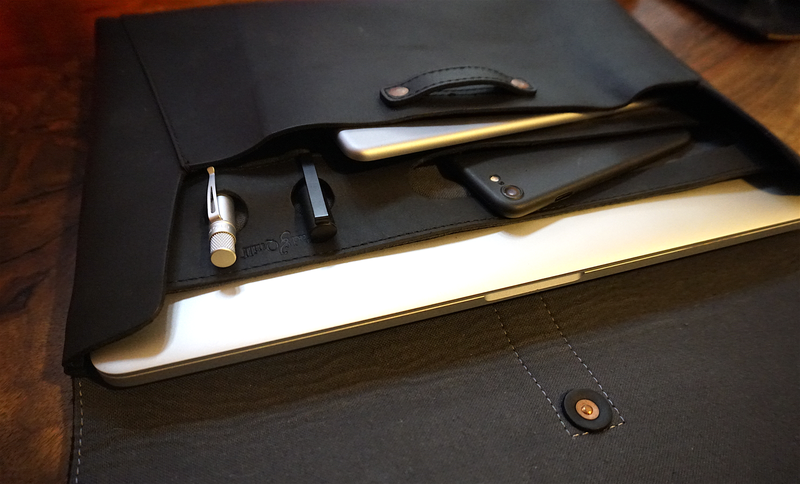 Also included is a secondary pocket in front that offers room for an iPad (9.7-inch or smaller) or your MacBook’s cables, adapters, or other accessories. A third pocket will fit an iPhone, spare battery or similarly sized products, and two pockets next to it to hold pens, an Apple Pencil, or stylus. The bag didn’t disappoint when it came to living up to the usual Pad & Quill craftsmanship. The company uses incredibly soft to the touch full-grain leather that has a distinct matte black look, parachute-grade nylon stitching, and the hand-pounded copper rivets mentioned above. It’s confident enough in the durability to give all bags a 25-Year warranty. The images throughout were taken after a few weeks of regular use and a couple flights. All models are available from Pad & Quill’s website: $169 for the 15-inch version, and $139 for the 11- to 13-inch and the 12-inch versions. It also comes in a few other color options including dark chocolate and chestnut in addition to the galloper black color I reviewed.